Largehearted Boy: Book Notes - Garfield Ellis "The Angels' Share"
Book Notes - Garfield Ellis "The Angels' Share"
Garfield Ellis's The Angels' Share is a fast-moving literary pageturner. "It takes a lot to stand out in the crowded field of Caribbean lit, but Garfield Ellis grabs mystery, family, love, hate, longing, and loss, boils them down to a Jamaica we don't always see, and rises to the top." 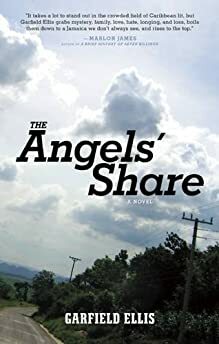 The Angels' Share on some level is a multi-themed story about a road trip on which a father and son attempt to settle some of the unreconciled fissures in their relationship. Music plays an important role in both the story itself, as well as the writing process that produced it. Not only are several songs sung by various characters throughout the book, but music created a consistent atmosphere that nurtured my creativity throughout the entire process. I created a playlist that would run in the background as I wrote. The list had no boundaries in terms of genre; it consisted of reggae, old country and western, pop, jazz and even had some instrumental classics thrown in. The one condition was that it represented, in a general sense, the time and the various moods and mindset of the different characters. Therefore I was able to listen to some songs over and over again while I searched for a particular mood or feel. Kris Kristofferson – "Help Me Make it Through the Night"
An old Kris Kristofferson classic, this song represents one of the central themes in the book. The Angels' Share is about a man who is about to embark on a dark period of his life and is asking his eldest son to accompany him on this journey and help him make it through the night. In fact, one of the working titles of the story was Through the Night. The song is the father's favorite, which he is almost always humming, thus it is quoted in several conversations and dialogue. Though there are several covers to this song, I still prefer the original Kris Kristofferson version because of the laid-back, almost melancholic air he gives it, along with an authentic universal feel. One is urged to get that the song is not just about a woman wanting a lover, but that it represents any despairing call for company through lonely and uncertainly desperate times. Buju Banton - "All Will Be Fine"
One of Buju Banton's finest productions and (in my opinion) one of his most underrated songs. This song does not carry the harsh, pounding reggae sound that is Banton's trademark. Here Buju strikes a soft almost spiritually motivational tone. This is perhaps the only song that Buju has done with the accompaniment of an entire choir. And all will be fine . . . I played this song repeatedly, especially as I worked on the final drafting of the final sections of the book. In this motivational song you are forced to accept, deep in your heart, that if you persevere it will be ok.
Tanya Stephens – "Looking Up"
A subdued and romantic Tanya Stephens rendition that focusses on intimacy and the forces of the heart rather than the raunchy, rambunctious sexual rhythms for which she is famous. Here we are forced, by subdued intimately persuasive tones, to appreciate the moment and what it places before us. Looking up? Why don't you look around you…? A major question that several characters face in the novel. Dennis Brown: "Inseparable," "For You"
Dennis Brown is arguably the truest "Voice" that reggae has produced, bar none. The range of his flawlessly powerful vocals is still unmatched by any Reggae singer to date. And in this album, Inseparable, he is at his mellowing best. Most of the songs from the Inseparable album are part of the play list but the title song Inseparable and my favorite, For You, speak to the durability of love and the extent to which a smitten heart will go to find, repair and preserve it. Jah Cure - "Love Is"
There is something so hauntingly beautiful, almost plaintive about this rendition, that it brings goosebumps. Jah Cure wails and pleads as if desperately trying to convince a reluctant ear that love is, much more to life than just words. It fit so effortlessly into the heart of the book as something that both main characters need to hear, that I found myself humming the tune long after I would be finished working for the day. Beres Hammond – "What One Dance Can Do"
There is a raunchy and promiscuous element to this book also, and some characters do have a wild and reckless past. This irreverent Beres Hammond tune about a man threatening to take another man's woman after one dance at a party, plays right into the theme of a young and reckless man who is not afraid to "cut and go through" breaking hearts as he goes and feeling entitled to have any woman he wants whether she belongs to someone else or not. Cassandra Wilson – "Blue Light 'Til Dawn"
If I could, I would put this entire album on this list. But I will just mention two of my favourites. Though an album of mainly covers, Cassandra Wilson places her mark on each song. One can almost get drunk on her smooth, smoky, seductive vocals. This was another part of my playlist that I listened to over and over again, just to get the melancholic mood just right. . .
An old song, covered many times, but you can't help feeling that Wilson owns it. What works for me however, are the powerful lyrics. For there are so many actions by the various characters throughout the novel, that are unexplainable unless one knows, or at least understands, what love is. "Tell Me You'll Wait for Me"
Though a cover of an old Ray Charles tune, Cassandra Wilson lends a haunting lonesome quality to it that fits smoothly into one of the main themes of my novel. There is a cold longing in the rendition and the base almost throbs like a lonesome heartbeat. Luther Vandross – "Dance With my Father"
The book contains a scene in which the main character actually dances with his father. Though the scene was not influenced by the song, it certainly reinforced and confirmed the need for intimacy between fathers and sons. And not just the need for father/son relationships, but the fact that it is ok to love your father and to be intimate with him in a wholesome way. And certainly ok to dance with your father, look into his eyes and find the love or whatever feeling is there. And of course, Vandross 'deeply soulful rendition would almost bring me to tears every time I listened. It is no wonder that this turned out to be perhaps one of the most moving scenes in the book. Celine Dion – "Taking Chances"
Don't know much about your world. But what do you say to taking chances. . . When it comes to powerful love songs Celine Dion has a larger repertoire than most. But Taking Chances is not just about romance, it is about walking away from the norm upon a whim and chasing a desire and an impulse despite uncertainties and fear. It is about making a choice. This is part of the dilemma of the novel's main character. A man of structure and systems, he is reluctant to act on instincts or enter unfamiliar territory on impulse alone - no matter what his heart says. George Jones - "Still Doin' Time"
Though this song is about a cheating drunk, and the character it reflects in my novel is not, in a strange way, both characters are imprisoned by regret. After all these years, both are still doing time - haunted by guilt for having left a lover because of their own ridiculous flaws. Barbra Streisand - "Everything Must Change"
And finally, a soft sweet, gentle urging towards acceptance. An exclamation mark from an enduring voice gifted with the ability to imbue the perfect tone and the perfect mood on any grouping of lyrics. Everything must change and there is no getting around it. We must accept this and move on. The Angels' Share is the angels' share. We get what's left and that is enough, and it is ok. It is enough to keep us. Life is not static, it does not stay the same, and it changes with time. Everything must change. Once we understand and accept that, we can move on to some degree of contentment or even happiness if we are lucky.